Original post date November 23 2016. The Functional Movement Screen (FMS) was developed as a system for health and fitness professionals to identify movement dysfunction, as well as improve communication between healthcare and fitness professions. In it's original form the FMS was a process intended to rate and rank junior athletes on their physical readiness to train or compete. Now, the usefulness of the FMS has reached beyond athletes and has become an important process in assessing physical activity readiness in athletes but also in the physically active population who enjoy running, cycling, cross country skiing, downhill skiing, swimming, weight lifting, yoga and many other activities in a non-competitive environment. The FMS intends to be a proactive approach when clients are preparing for physical activity and sports. 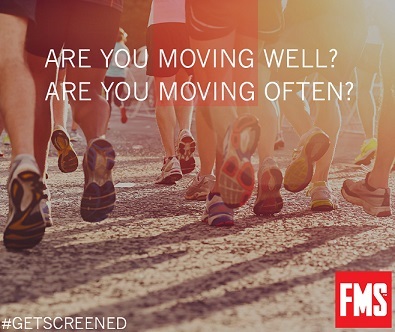 The screening process helps to detect movement dysfunction and helps to intervene as soon as possible and before we become injured. This leads to the fundamental philosophy of functional movement screening. First Move Well, Then Move Often. Why do we use it and how can it help you? In summary, the FMS exposes dysfunction or pain—or both—within basic movement patterns. In real life, many people are able to perform and participate in a wide range of complex activities, such as hockey, soccer, basketball, squash, yet are unable to efficiently execute many of the basic movements in the screen. They are unaware that they are compensating their movement quality for movement quantity. Typically this leads to problems sooner or later. As a certified health professional, I see that individuals who score poorly on the screens are often using compensatory movement patterns during those activities. These compensations become normalized and often a chain reaction occurs; sub-optimal movement patterns are reinforced in complex activities, which then leads to poor biomechanics and can contribute to a future injury. How is it performed and what does it test? Step #1 – The Screen! The Functional Movement Screen is a series of 7 movement tests that challenge balance, mobility, stability and co-ordination. The movements require the client to move and stabilize through some challenging poses and postures. The trained health professional then observes patterns of dysfunction, weakness, imbalance, asymmetry and limited movement. These are compensations in basic movement that undermine our more complex movements and can lead to injury. Step #2 – The Score! The client is then provided a score out of 21. Think of this as a "movement IQ". Although the actual number score does have some significance, the real importance of the score is to provide you with a movement baseline which you can build upon. It’s a starting point, not an end point. Whether you get 7/21 or 17/21, our goal and yours is to improve movement IQ! Step #3 – The Solution! Starting with the greatest areas of movement deficiency, limitation or asymmetry, we then provide customized corrective exercises to address these movement compensations, and book a follow up 4-8 weeks later to review progress. Often there is a significant improvement in movement baselines by following the corrective exercise program for just 4 weeks. For Example, when performing a FMS on runners I often see: glutes that don’t activate, hip flexors that are trying to do the work that our core should be doing and a complaint that they are always “pulling” their hamstring. Corrective strategies are usually focused on activating those glutes, core stabilization in left vs right contralateral movement, and core stabilization in rotation patterns of upper limb vs lower limb. When and how to book you FMS? The right time to book your movement screen was yesterday, but tomorrow will do. 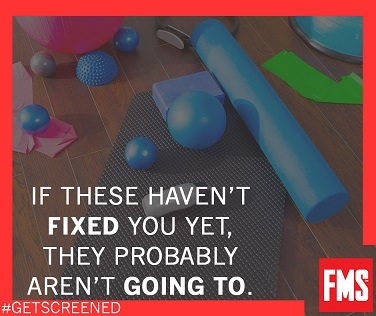 The functional movement screen is a proactive step to addressing movement problems and works best before you get injured, so the sooner the better! To book a screen go to www.axisrmt.com and book an appointment for Functional Movement Screening with Adam Smart, he is a RMT, FMS Level 1 Certified professional and Human Kinetics Graduate from the University of Ottawa.